My friendly editor Jody has sent me the edit of the manuscript, and I am supposed to be re-editing right now. Tomorrow afternoon I send it back to her and after she looks at it, the book goes to the typesetter! This is my first book experience (I used to work for a weekly), so I'm learning a lot. It's a very long process and not easy either. There is so much in the media about the terrible recession we are headed for. It makes me wonder if readers are going to still have enough care for turning 'sustainable'. They may be more worried about whether they can pay their mortgages. So....I'm thinking about changing the title. 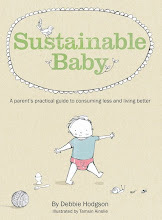 Buying Less for Baby - A Parent's Guide to a More Sustainable Life. The contents of the book will be exactly the same; however the reasons for buying it may subtly change. I mean, the different priorities behind the reasons may be re-ordered!